Boy, Rose Hairs are strange. My rose hair Lucille has these strange habits. I feed her up to 2 times a week. Well, one day she refused it. So I tried again a couple of days later, with no luck. Next thing I know two months go by and I have a thought that she might molt, but she doesnt look like it at all. Two weeks ago I popped a cricket in there and BOOM, it was a goner. But now she won't eat again! I love my Rosea, but dang shes a mystery spider to me. That's a rosie for you really. My Rosea wouldnt eat for Dan, the guy I got her from. But now for me she eats like a pig. They are strange Ts. Yeah roseas are normally like garbage disposals when it comes to food, but they are also known to go on hunger strikes for months at a time. My rosea is a Haplopelma spp in a rosea suite. Mine will eat if the cricket bothers her too much or she goes on a mood swing. 60% of the time she just watches them but the other 40% she goes OBT on, lol. My rosea has been on a hunger strike for 6 months now. When I first got mine she thought she was an OBT and wouldnt eat for nothing, now shes calmed wayyy down and is a garbage can on 8 legs. They are so under rated, everyone should have at least one rosea. I cant wait to get my RCF rosea from madamwlf. She says shes a little demon. Haha, shes decided to go gangster on me a couple of days ago! I was putting a cricket in there when she came flying at me threatening to bite! First time this has happened. 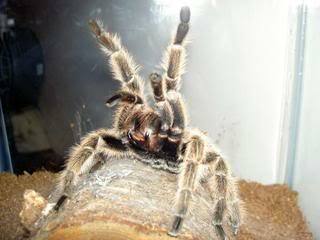 That male rosea who just molted for me last week has been seen several times in pokie stance. Subject: Re: Boy, Rose Hairs are strange. » Rose hip brandy ?? ?